Dr. Reichel and Pacific Dermatology & Cosmetic Center are excited to introduce the only FDA approved treatment for CELLULITE. Cellfina is a minimally invasive, one-time procedure shown to improve cellulite. It combines a proven approach with innovative technology to smooth the dimples and pockets of cellulite on the thighs and buttocks. 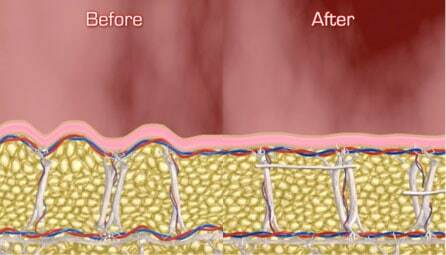 Cellfina treats the primary structural cause of cellulite – the connective bands woven throughout fat. These tight bands pull down the skin, creating the puckering you see on the surface. Like a rubber band under tension, once released, the treated skin bounces back to smooth itself out. Cellfina is brand new. However, the studies that were done to prove efficacy showed significant reduction of cellulite. What is amazing – 96% of patients reported high rates of satisfaction – and that was TWO YEARS after treatment. The exciting new Cellfina is only offered by a group of premier physicians. As leaders in the field of aesthetic surgery, liposuction, and cosmetic medicine, Dr. Reichel, and Pacific Dermatology & Cosmetic Center are one of the only clinics in the Pacific Northwest and Seattle to offer the treatment. Results of the treatment show up about one month after treatment. There is minimal downtime (some bruising and tenderness), and no serious side effects were shown in the study. AND, patients tolerate it quite well. Before the procedure, the skin and underlying tissue are numbed with lidocaine. Therefore, there is little pain associated with treatment. We do recommend taking a couple of days after the procedure to rest – but you could go back to work the day after treatment if you really need to. Please check out our Cellfina page, visit realself.com to see reviews on the treatment, or come in for a consultation with Dr. Reichel in person.